Unfortunately Barry Zito is not starting tonight, however. It's a shame that Yoga Day didn't fall on a Barry Zito start, because that would have been incredibly fitting. 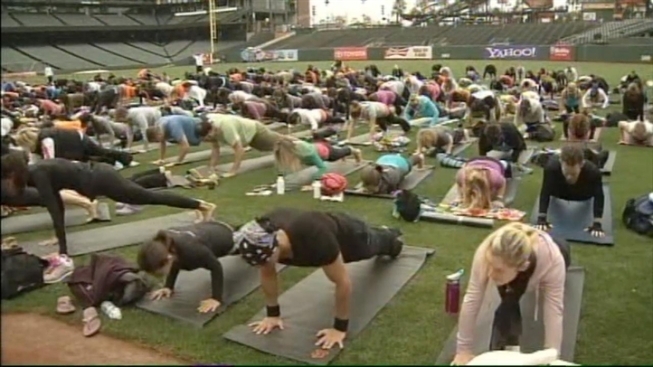 As it is, Madison Bumgarner doesn't exactly fit the bill, but that's OK: the Giants hosted Yoga Day at AT&T Park on Wednesday. Yoga Day featured a yoga session (see: above) with "San Francisco's premier Vinyassa yoga teacher" Janet Stone, and it basically involved a lot of people strengthening their cores on the grass at AT&T. But wait, there was more! Michael Franti, "famed Bay Area native and world-renowned musician," also performed. He's the dude you see above with the dreads. The yoga session went from 8:00 a.m. PT to 9:15 a.m. PT, with Franti (who's always got something playing Sirius XM's "Jam On" channel) busting out tunes and Stone providing instruction. Franti's also a Giants fan, so that helps, as does his willingness to use the event to help promote Power to the Peaceful Foundation and his yoga retreat in Bali. As part of the experience, anyone who participated received a San Francisco Giants-themed yoga mat. Oh yes! And a baseball game. The aforementioned Bumgarner's taking on Trevor Cahill in the rubber match for the Giants on Wednesday night and, theoretically, that matchup should help these yoga-lovers relax even more, especially if the Dodgers can lose again.